Tuesday night’s workshop at Red Barn Mercantile was so fun! There were about 10 folks in attendance (including my dear friends Brandy and Carina), and all had great questions! The discussion lasted almost two hours, and we covered everything from compiling a house wish-list on Pinterest, the design process, choosing a contractor, and almost everything in between. Lindsey was a rockstar and created a hand-out further detailing these topics. I provided two hand-outs: “20 Questions to Ask Yourself Before You Get Started” and “20 Questions to Ask an Architect”, both of which I found on the AIA Austin website- check them out here. We discussed the wonderful resource of local AIA offices, which are not just for architects! The office for Northern Virginia is right in Old Town, and they also occasionally hold workshops like “How to Work with an Architect”. But, as Amy said, will they have wine and cheese and comfy sofas to sit on? I answered some of the more technical questions (like “What’s the difference between an architect and a designer?”) and Lindsey provided anecdotal thoughts from her experience watching her parents work with an architect on both renovations and a new construction project. Hopefully we provided some insight into the process of hiring and working with an architect. 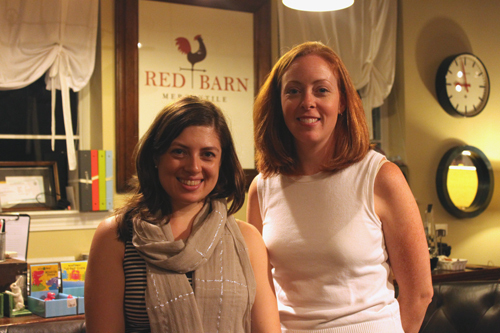 I think it’s so incredible that Amy, the owner of RBM, hosts these workshops for the community. Thanks, Amy- I had a great time! If you have any questions about how to hire an architect, feel free to email me. Maybe I’ll take this show on the road! Wow, you guys must have really like those pillows! Thanks to everyone that participated. It’s been really fun to read the comments, and I loved that there was such a nice distribution of tastes. I like the zig zag pillow and would put it in the rocking chair in our soon to be completed nursery. That’s exactly what I would do with it, Suzy! Suzy, please send me an email with your shipping information and we’ll get the pillow on its way to your nursery. Happy Wednesday everyone! Today is a special day for Architecture Babble because I am hosting my first ever reader giveaway! A few weeks ago I was contacted by a cool company that sells lots of fabulous stuff, everything from kids bedding to swanky modern furniture. Lately, I’ve been checking out the selection of crib sheets and retro/modern nursery furniture. They’ve got some pretty great stuff, like the Eames rocker. The generous folks at the CSN stores (who own cool sites like AllModern.com and AllChildrensFurniture.com) have offered one of my lucky readers a chance to sample one of their products. I chose three pillows from AllModern.com, and all you have to do is leave a comment. I’m psyched about these options and would love to win any one of them. Sadly, I cannot enter this giveaway, but YOU CAN! -Leave a comment on this post telling me which pillow you like best and where or how you will use it. -Contest will be open until 8 pm on Thursday, March 11, 2010. -I’ll randomly select a winner (using a random number generator) and announce it on the blog on Thursday evening. -Contest is open to U.S. and Canadian residents only (sorry to my international readers). Yep, we’re pretty socked-in with snow right now. And there’s more on the way. I am trying hard to not think about snow as jail, but it does feel a little bit like that to me. Certainly not what I anticipated when moving to Virginia. I know, it snows this close to the Mason-Dixon line, but generally not this much. I think I know what those Minnesotans feel like each winter, without all the appropriate gear and expertise. So, this weekend was filled with working on some home projects (yay spiffy closet! ), sewing, eating hearty food, watching Rudy enjoy the snow, and of course internet-browsing. I’ve been wanting to share a few sites with you, loyal readers. Some I’ve known about for a while, and some I’ve recently found and just must share as my mama always taught me to. Young House Love. Have you seen this blog? I think I am behind the times on this one (I usually am) but these people are pretty much my idols. They bought a sweet little 50s ranch house outside of Richmond and have been renovating it for the past few years, blogging about it, and turning that into their full-time job. Incredible. I don’t always agree with their style, but I love that they give full-on tutorials of most of the projects they’ve tackled, complete with their mistakes, photos, and what everything cost. They’ve been featured on numerous websites, magazines, and are now contributors to Better Homes and Gardens Do It Yourself magazine. Sheesh. So I go there every so often and check out what they are up to, though I still haven’t added them to my Reader. I’ve got a little bit of blog-reading guilt (read: I probably spend too much time reading about other peoples’ lives) so I’m very picky about what I add to my Reader. But I’ll probably add YHL soon. It’s addictive. Ten Dollar Drawings. I can’t remember how I found this site, but I heart it. I will definitely be asking her to make me a drawing for $10. I just need to decide what I want drawn. Ideas? SpringPadIt. Another one I’ve known about for a while but finally took the plunge and set up an account last week. Previously, if I found a great website, I would either keep it up as a Tab for weeks (okay, it’s still a habit I’m trying to break) or email myself the link. But with SpringPad, you can keep track of all the cool things you find online, and categorize them. So far, I’ve set up a recipes file and one for potential blog material and various other things I’ve come across (mostly through Apartment Therapy). It’s been great to have all my links in one spot, and I don’t have to freak out if my tabs are closed unexpectedly. Hope you check one of these out sites. Let me know if you do.